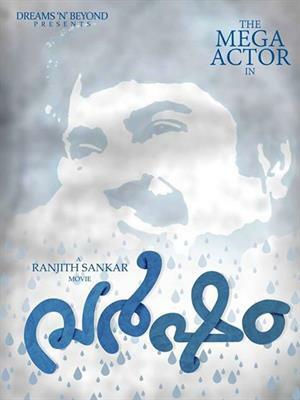 Varsham malayalam movie (film) to be directed by Ranjith Shankar will have Mammootty in lead. Set in the backdrops of a family, the movie pools into the after effects of certain intriguing incidents which happen in the life of the lead character played by Mammootty. 'Varsham' will be produced by the director himself, under the banner of his home productions, Dreams N Beyond. Sujith Vasudev will be the Director of Photography (DOP) while the music for the movie would be safe in the hands of by Bijipal. After the majestic success of 'Punyalan Agarbathis', film maker Ranjith Shankar is gearing up for his next project, this time with actor Mamootty. Titled 'Varsham', the movie set in a family background tells the story of an ordinary individual. The movie pools into the after effects of certain intriguing incidents which happen in the life of the lead character played by Mammootty. 'Varsham' will be produced by the director himself, under the banner of his home productions, Dreams N Beyond. Sujith Vasudev will be the Director of Photography (DOP) while the music for the movie would be safe in the hands of by Bijipal. The title 'Varsham' has much to play in the story. The feel of rain, blessings, showering all is closely connected with the name 'Varsham'. The movie which would start rolling from June is expected to reach theaters during October as Pooja release. With two heroines, the final cast would be a announced soon. The first poster of the movie which was released recently looks so poetic and interesting. The actor seems to be too busy this year with a number of projects in kitty. Ranjith Sankar made his entry as film maker with the much acclaimed movie 'Passenger' which really opened the so called new waves in malayalam film industry. Credited as the director of 'Arjunan Saakshi', the movie starring Prithviraj in lead was inspired by his real-life experiences and won optimistic reviews from the critics. His next project 'Molly Aunty Rocks' too was a commercial success. 'Punyalan Agarbattis' was the last entry which was declared one of the biggest commercial hit of 2013. So as the malayalam movie lovers are much confident about the directorial skill of Ranjith, the expectations would be at its peak. With Mamootty joining with Ranjith for the first time, the film maker would have to take much care in writing the screenplay and the execution too. Even with a number of projects in kitty, Mamootty fails to get a hit movie in his name during the past 2 years. So can 'Varsham' turn his fortune? Let us wait and see. Vellimoonga malayalam movie (film) directed by debutante Jibu Jacob will feature Biju Menon, and Nikki Galrani in lead. Scripted by Joji Thomas, the movie revolves around the life of an unmarried politician. Aju Varghese, Lena, Tini Tom, Kalabhavan Shajon, Siddhique, Anu Joseph and Sunil Sugatha will give life to other prominent characters in the movie. This movie is being produced by Ullattil Shashidaran under the banner Bhavana Media Vision. For the lyrics of Rajeev Nair, Biji Bal has set the tunes. Peruchazhi malayalam movie (film) written and directed by Arun Vaidyanathan stars Mohanlal and Mukesh in lead. Vijay Babu, Aju Varghese, Ragini Nandwani, Sandra Thomas, Shankar Ramakrishnan, Baburaj and Delhi Ganesh would give life to other prominent characters in the movie. Produced by Vijay Babu and Sandra Thomas under the banner Friday Film House, Peruchazhi would be one of the costliest movie to be made in malayalam. Ameya Oru Bavul Penkutti malayalam movie (film) directed by Nadeem Naushad is having Babu Jose, Harsha Mariyam Sunil and Sarayu in lead. This movie made for children tells the story of a small girl who loves the nature and wish to make the future generation the importance of preserving it. Faisal and Shanoop will give life to other prominent characters in the movie. Written by Nidanth L Raj, Nadeem Noushad, this movie is being produced by Sibu George. Know more about the movie 'Ameya Oru Bavul Penkutti'.